Workers deserve the best when it comes to hydration. Provide your team with the safest, cold drinking water available. IPS prepares each cooler using an elite filtration system for both water and ice, which are never touched by human hands. Delivery is available for your next turnaround or project. This is a Step-by-Step process - This system explains how the customer receives its first class water. Stage 10: Carbon filters that further remove impurities that may cause taste, color, odor, etc. 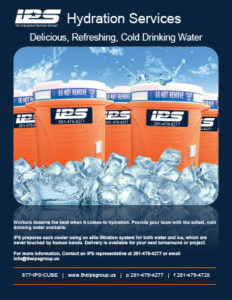 The IPS Group is ready to provide the safest, cold drinking water to your next project. Call us today to schedule a delivery.